So the other day, I wanted to make meatloaf. Then I was like, "Well, maybe I should make mini individual loaves!" And then my husband said, "And you should wrap them in bacon." I thought that was a great idea, so we went with it. I knew this was going to be a winning recipe. We make a lot of meatloaf around here. I don't care what anyone says; meatloaf is an awesome comfort food that just screams cold weather and begs you to be like, "wow, that was awesome." I also have a personal theory that making things in miniature makes them at least 45% cooler. It's not scientifically proven, but it is unscientifically tested without controls by me, so you can pretty much consider that science. Smaller foods taste cooler. Proven. Basically. The point in all this? This is a meatloaf meal you can make for guests. Yep, I said it and I'll stand behind it, too. But let's be honest, if you are making me stand behind any type of food, it's probably going to be eaten...by me. Let's get ready for some drool-worthy photos, shall we? It's no secret, I always use venison. 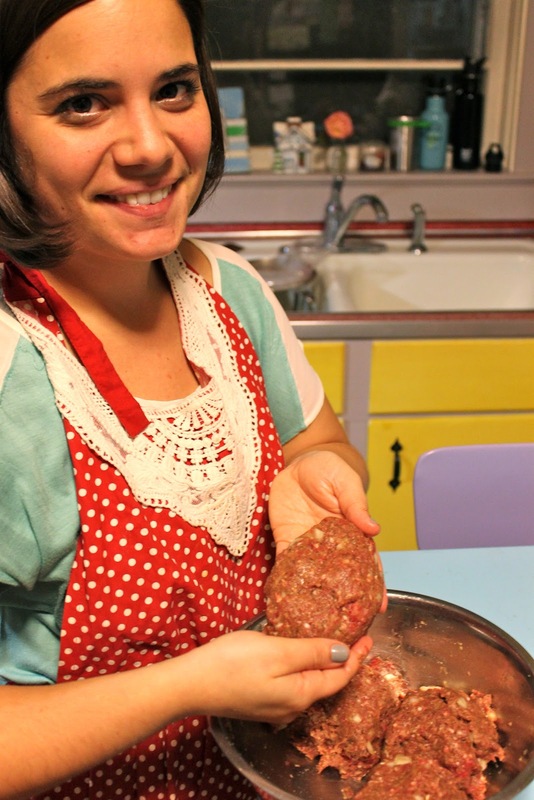 Venison is just my personal favorite, but you can use whatever you want--turkey, pork, beef. Your choice! Add half an onion, diced. Worcestershire sauce... can we talk about it a moment? Because I love this stuff. I want to drink it, but I must refrain...that stuff is pricey. I put a big old wallop of the "da sauce" in there because it makes the loaf taste heavenly. And lastly, a little bit o' milk. I use almond milk, but you can use whatever kind of milk you prefer. Now, this is important, make sure you remove your rings and bracelets. This is something that I always forget. I remembered this time, which was great because I didn't have to pick bits of raw meat and breadcrumbs out of my wedding ring... again. Oh yea, and it's mostly important because there is only one way to make a really banging meatloaf--and that is to mix it with your hands! So dig in, baby! I like to think of mixing with my hands like infusing my love into a dish. This is FULL of love. And very well mixed, if I do say so myself. Now that it's all mixed up, you are ready to make your mini loaves! Here I am: the proud mother of a mini meatloaf. Once your have four of those suckers patted into loaf-like shapes, you are ready to bacon them! Two pieces of bacon per loaf should do the trick. Seriously? How good does that look? So, you can totally add stuff to your ketchup topper...or you could even use barbecue sauce. BUT, if you are going to use ketchup, I say just go for it. Don't over think it. Don't be ashamed to let your ketchup flag fly. Now, pop these suckers in the oven on 350 degrees for 1 hour. And....SHABAM! Yes. Glory be to meat. This makes my mouth water. I served these [awesome] little loaves alongside some roasted white and sweet potatoes. It was juicy, bacony, and ketchupy in all the right proportions. In a mixing bowl combine the ground meat, onion, eggs, garlic, breadcrumbs, worcestershire, milk, basil, cayenne, salt and pepper. Using your hands, (and the using your hands part is important, but remember to take your rings off!) mix everything together until evenly combined. Divide the meat mixture into four even portions. 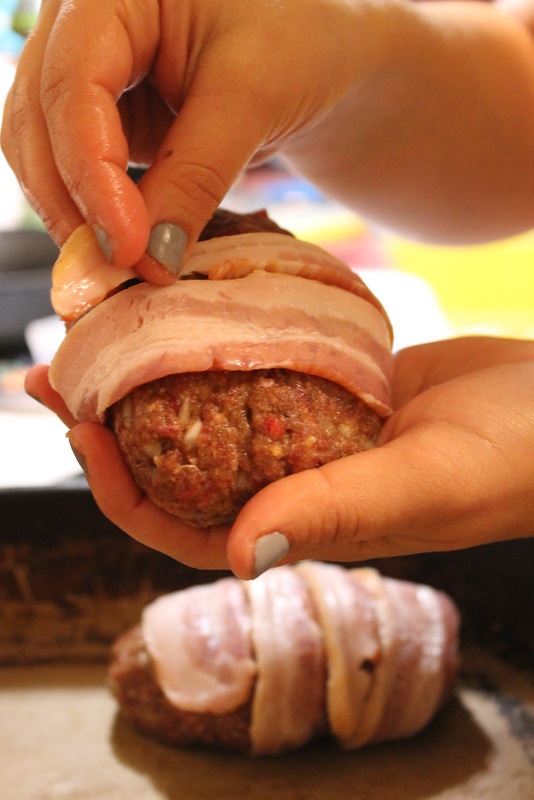 Using your hands, pat the smaller meat portions into individual meat loaves. 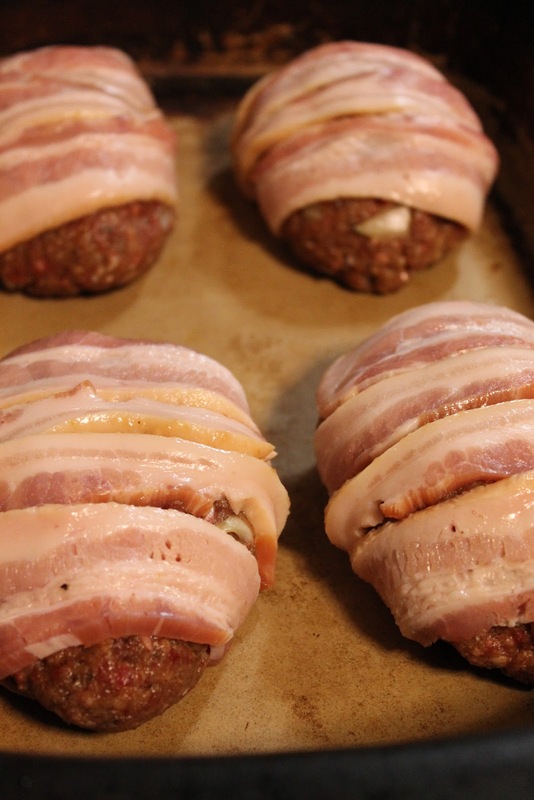 Wrap each loaf with two pieces of the bacon. Place the loaves on a baking pan. Top each loaf with either ketchup or barbecue sauce. Bake in the preheated oven for 1 hour. At the end of the hour, put a bit more ketchup (or barbecue) or each loaf and put the oven on Lo Broil. Continue cooking another 7-10 minutes to crisp up the bacon. Loved it - thanks for the humor and the recipe! will definitely try Mini version w/ bacon :) Bc what doesn't go well with bacon?? - oh, cooking it in the buff is advised against but other than that - all good things go with Bacon! You are so right: everything goes better with bacon. It is my husband's suggestion...like his only suggestion in the kitchen. "Add bacon" he says, and I oblige. This was GREAT!!! Thank you, everyone loved it!! Am I supposed to cover in foil before putting it in the oven? im currently making this but stuck on if I should cover it or not. Thanks! Oh my I got the most compliments for dinner tonight. These meatloaves were awesome. Thanks for sharing! Can you freeze the cooked meat loaves and take out as needed? Made these tonight and they were amazing! I sautéed the onion and garlic first, mixed ketchup and BBQ sauce on top. Delicious. Making this again tonight! I will never make any other kind of meatloaf - thank you for your great directions and recipe! Made these tonight for my husband and two kids. Absolutely wonderful! Everyone approved, and that's not always easy to accomplish! Thanks for sharing your recipe! Made these three times already. The last time I put cheese in the middle. Turned out great! I have also used Italian breadcrumbs. Does it really need to bake this long? Seems that since they are smaller than a regular meatloaf they shouldn't need as much time.